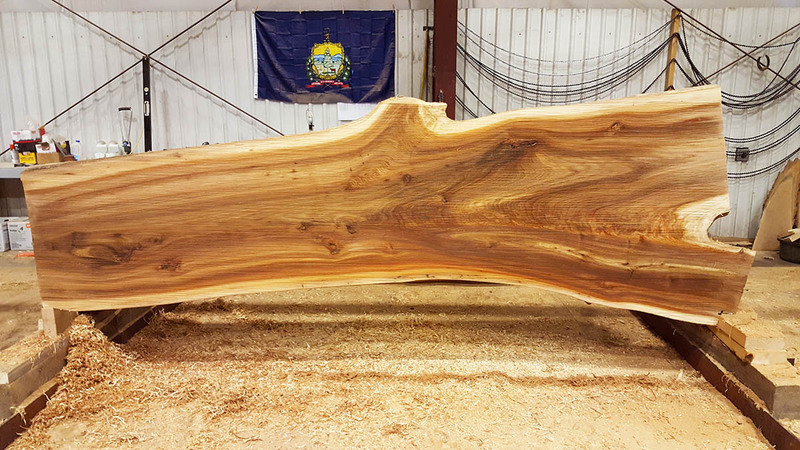 Furniture and home goods crafted from the Vermont Elm are now available in our showroom. 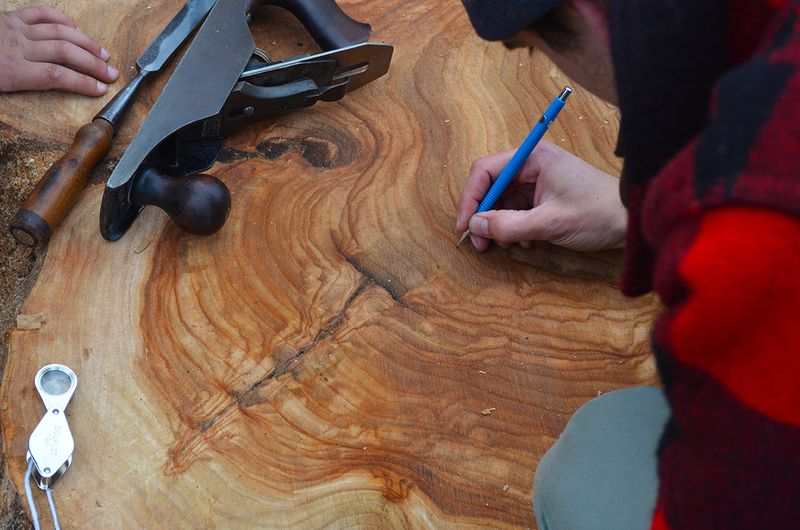 You’ll find coffee tables and cutting boards on our website. 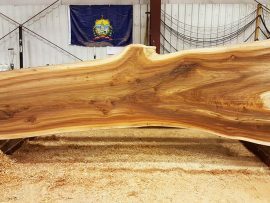 To talk with us about a custom order for a dining table, (any size – including conference or large communal), a bed or benches, email:info@vermonttreegoods.com or give us a call at (802) 453 – 4544 to learn more or request an estimate. 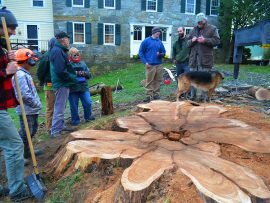 In the spring of 2016 the largest Slippery Elm in the entire northeast, located at the Garrett residence on Thompson’s Pt. 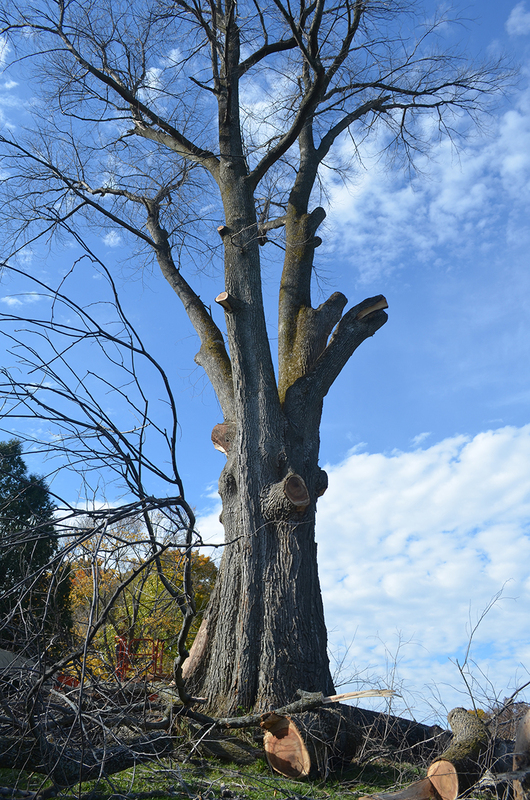 Road in Charlotte, died from Dutch Elm Disease. 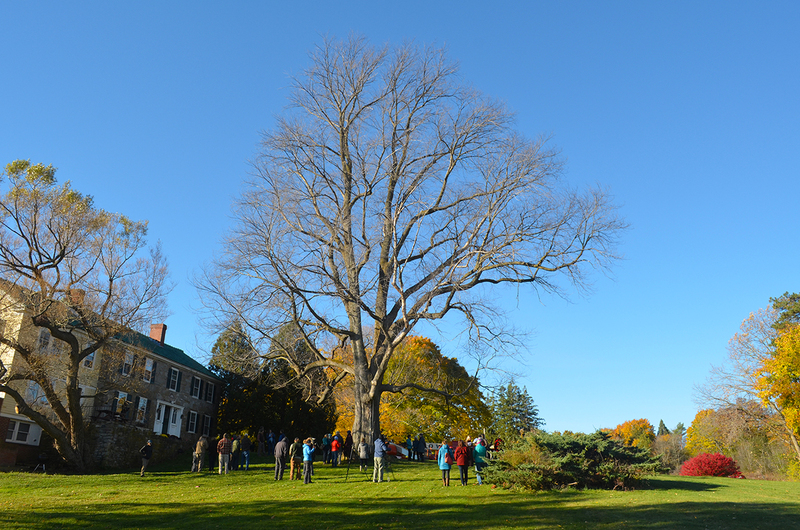 The tree measured nearly twenty feet in circumference. 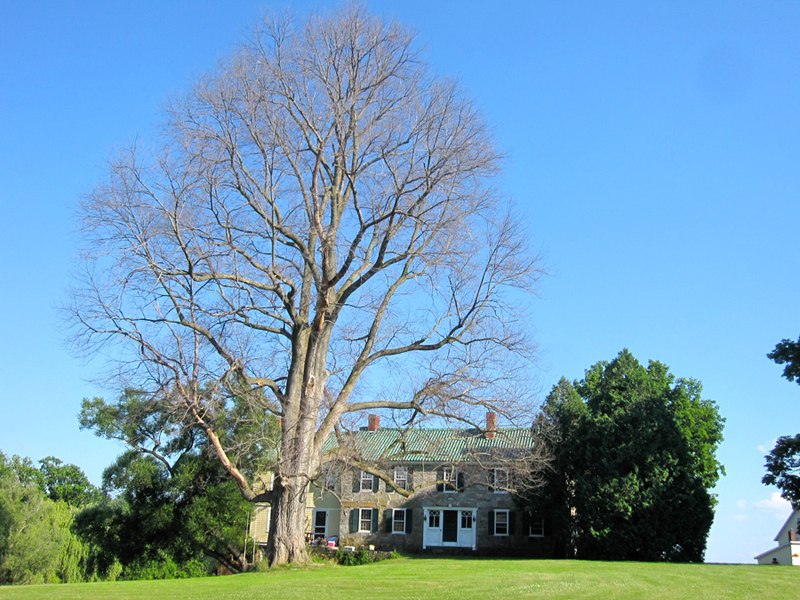 “The Vermont Elm” had been one of the few to remain years after the onset of this disease in the 1930’s. 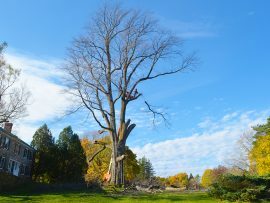 All over this state and the nation an estimated 77 million elms succumbed. 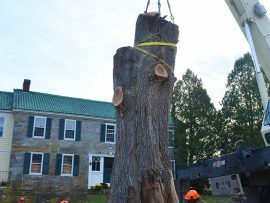 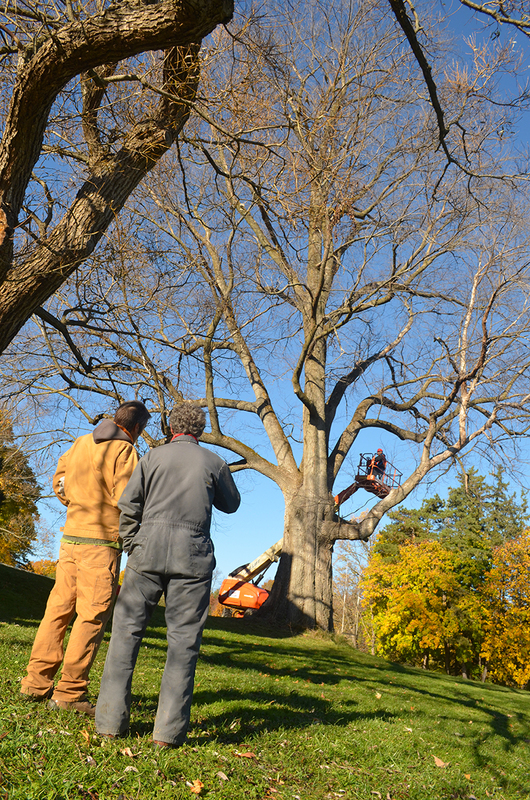 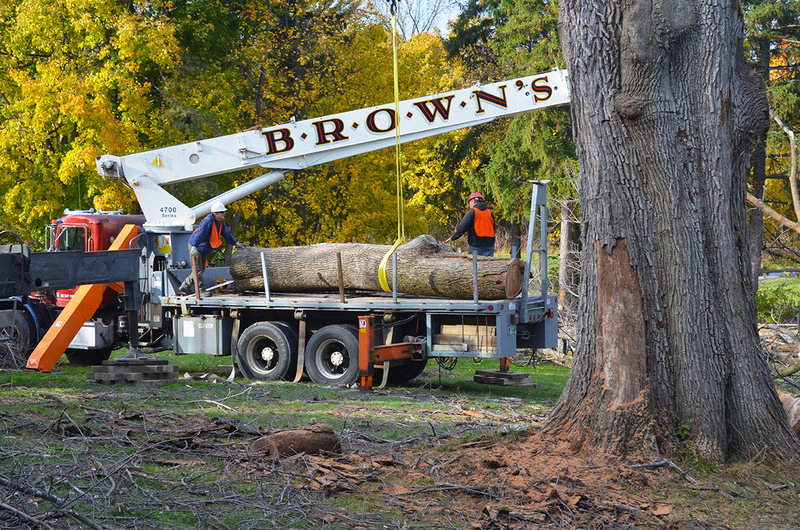 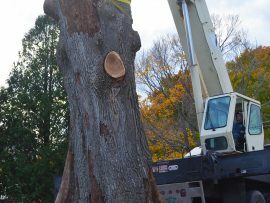 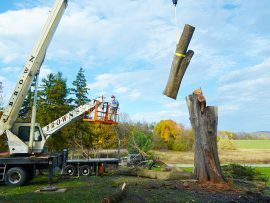 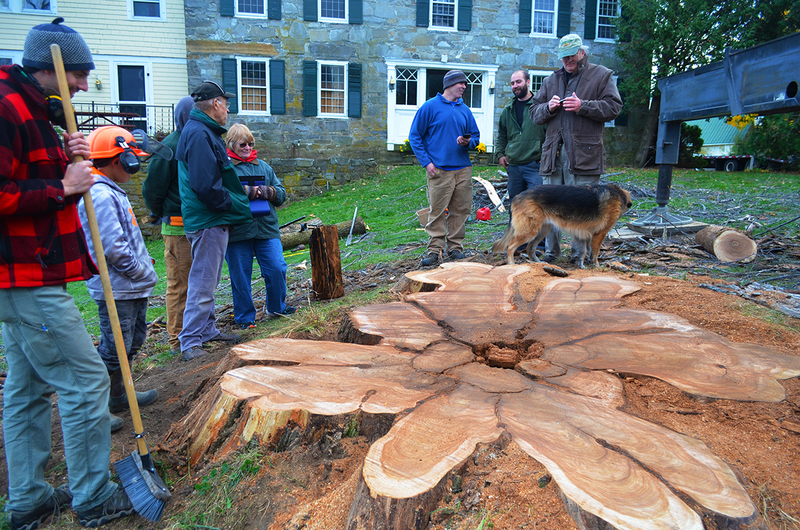 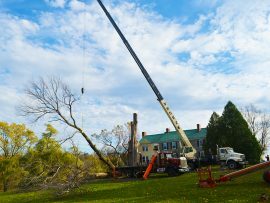 On November 1, 2016 Vermont Tree Goods directed the removal of this historically significant tree. 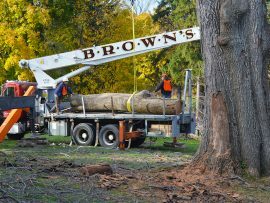 At our sawmill in Bristol it was milled into planks and kiln dried to provide warm, rose-hued wood for our distinctive home furnishings. 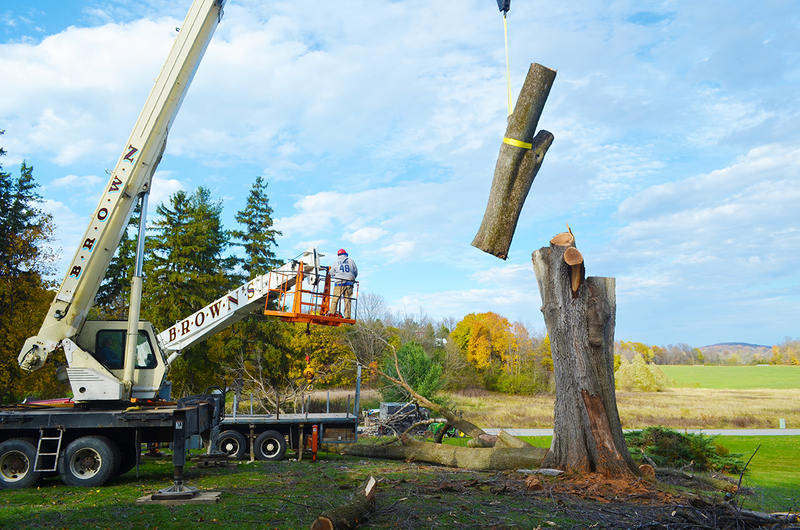 The Nature Conservancy’s work with forests is an inspiration for VTG. 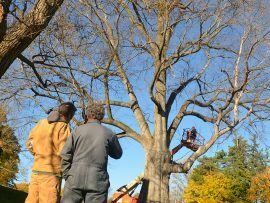 We share a goal of protecting and assisting forest growth as a means to store huge amounts of carbon dioxide from the atmosphere. 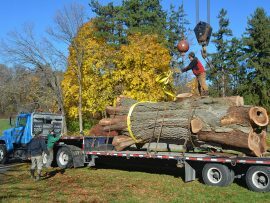 For every large, old tree VTG mills and turns into furniture, carbon is captured and held within. 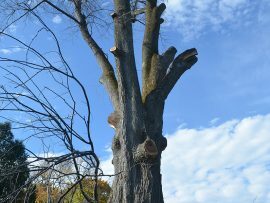 Using trees that have reached the end of their days prevents the removal of vital, living trees from the forest. 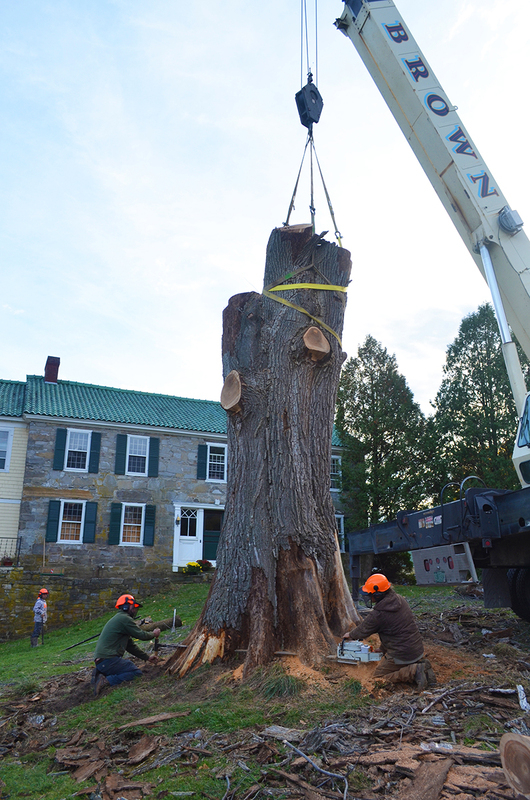 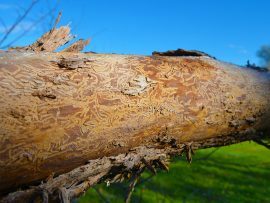 In the case of The Vermont Elm, several trees may have been saved! 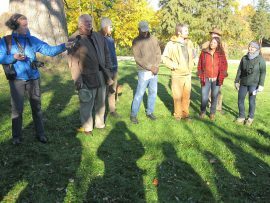 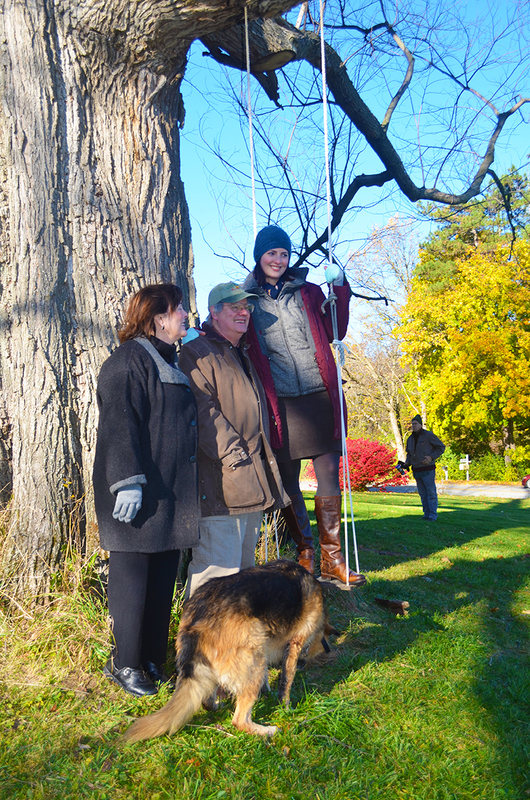 On November 1st before work began, VTG and TNC held a Tree Hugging Ceremony to honor this heirloom and share thoughts with local tree adocates. 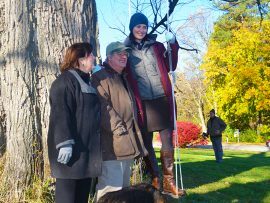 The ceremony included a heartfelt recognition of Larry Hamilton’s legacy and a celebration of all he did for Charlotte and its trees. 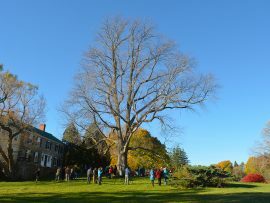 Groups of guests had the opportunity to give the massive elm one last hug. 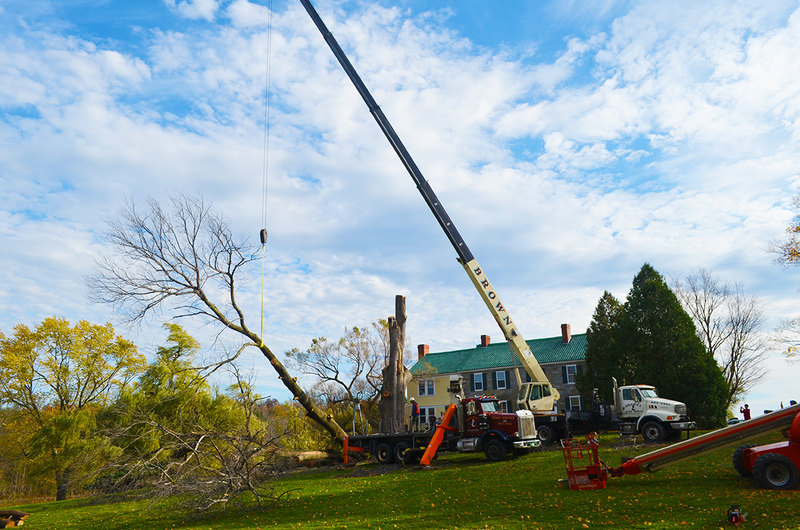 Tree work began at 10am and was successfully complete by 5pm. 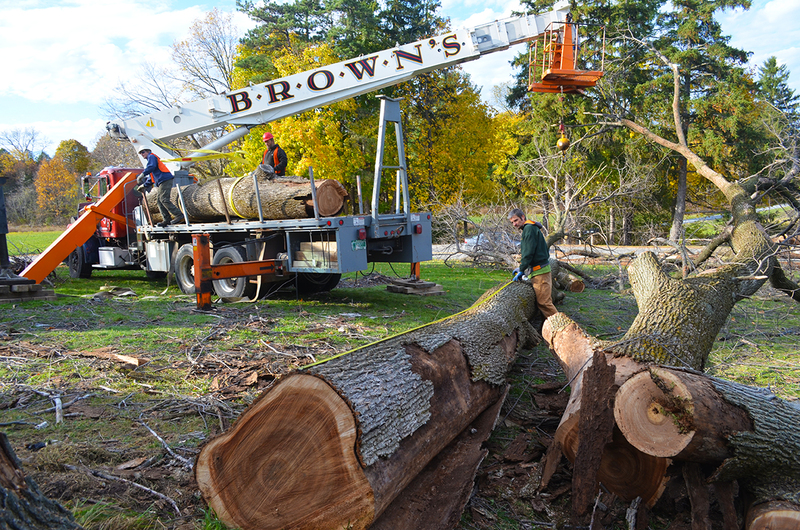 Most of the wood was transported to Vermont Tree Goods’ Bristol sawmill by the end of the day. 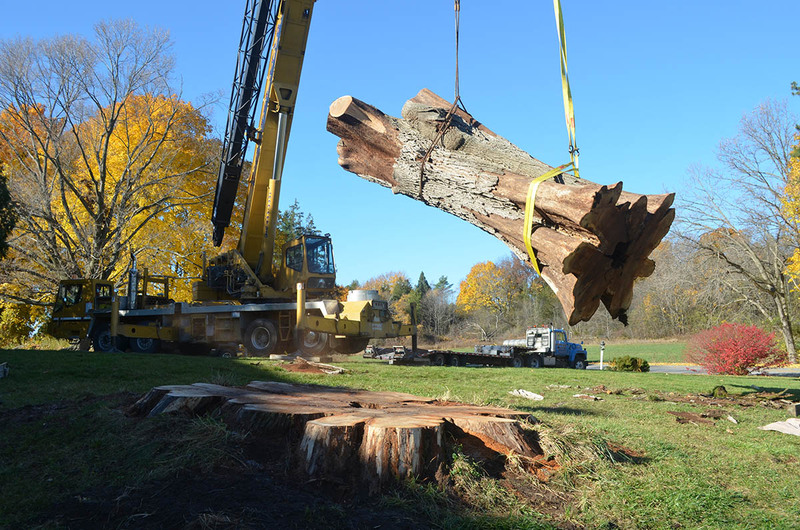 An additional crane and truck were necessary to pick up and transport the bottom 20 foot long section of the trunk, which weighed over 25,000 pounds! 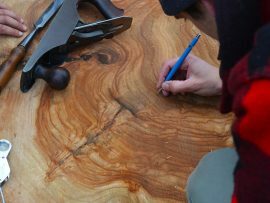 The wood is in great shape and is beautiful, with wide-ranging rosy tones. 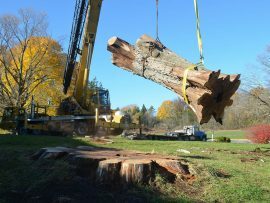 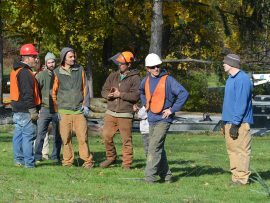 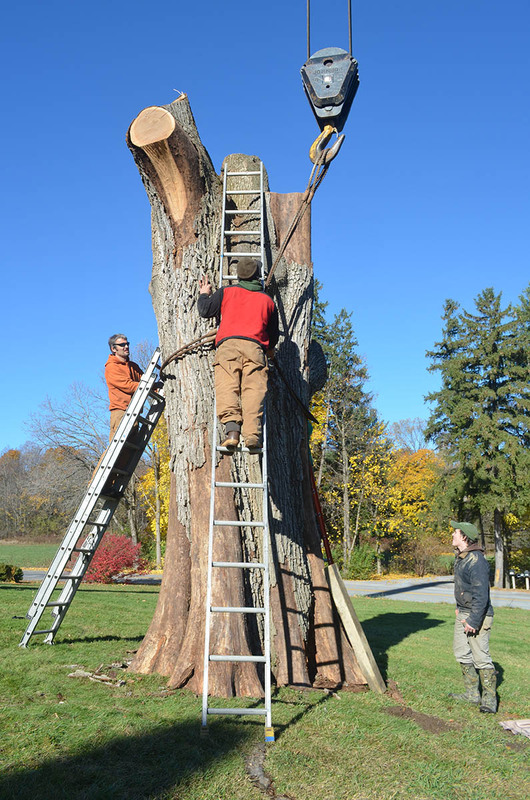 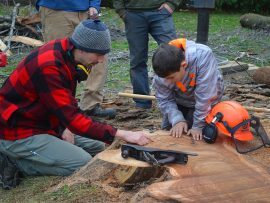 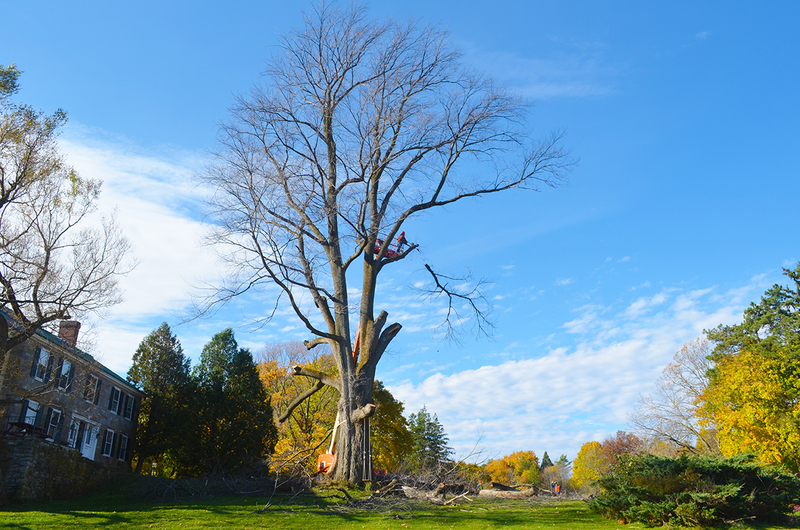 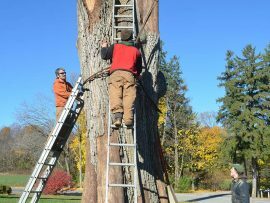 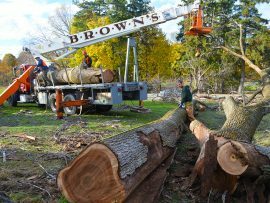 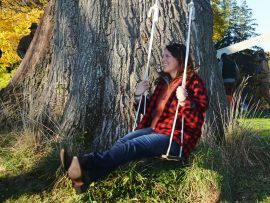 Vermont Tree Goods and The Nature Conservancy will publicize the process to bring attention to the plight of these stately elms. 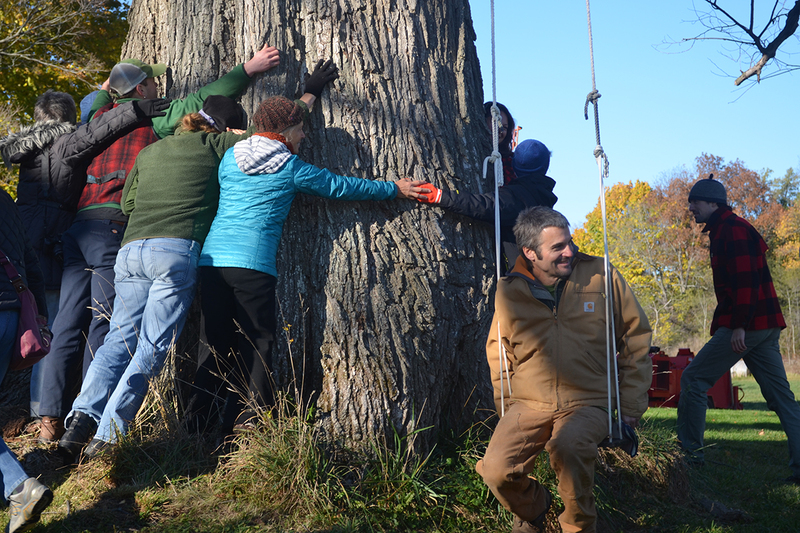 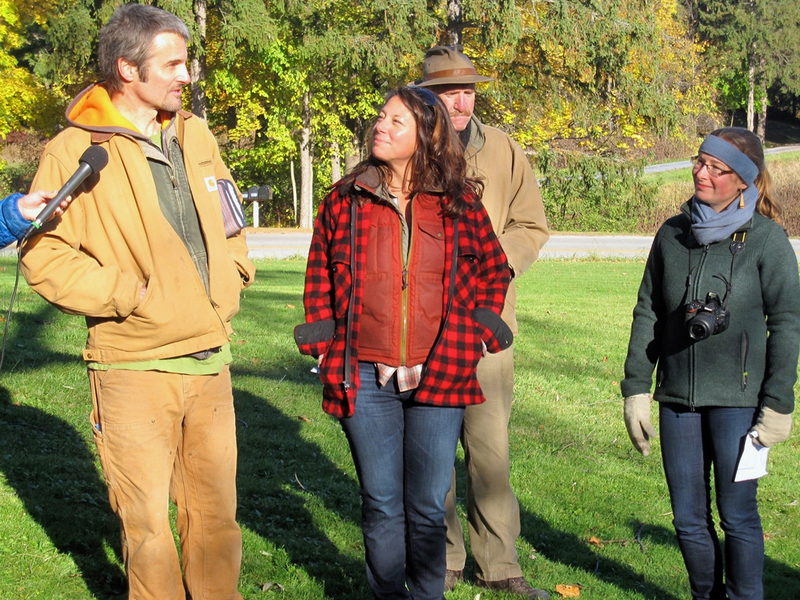 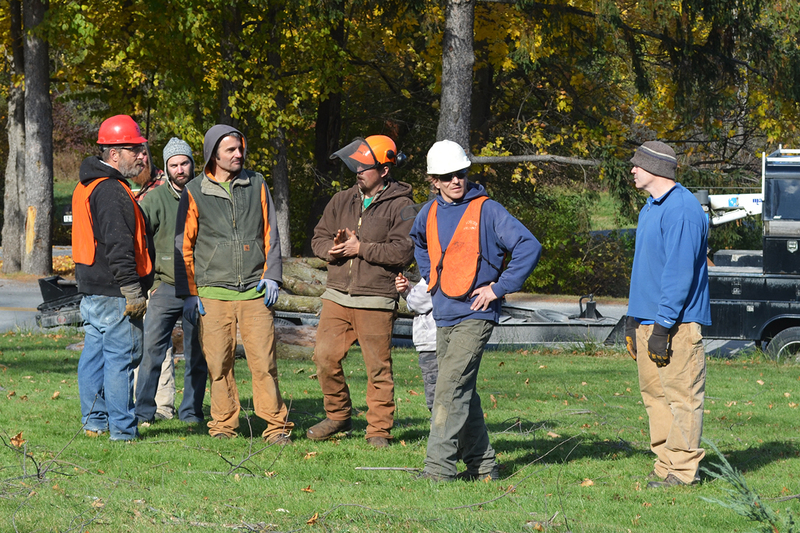 Together we will raise funds for the VT Nature Conservancy’s work to breed and plant resistant Elms in Vermont and in neighboring states along the Connecticut River valley. 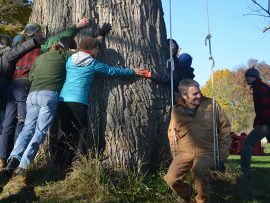 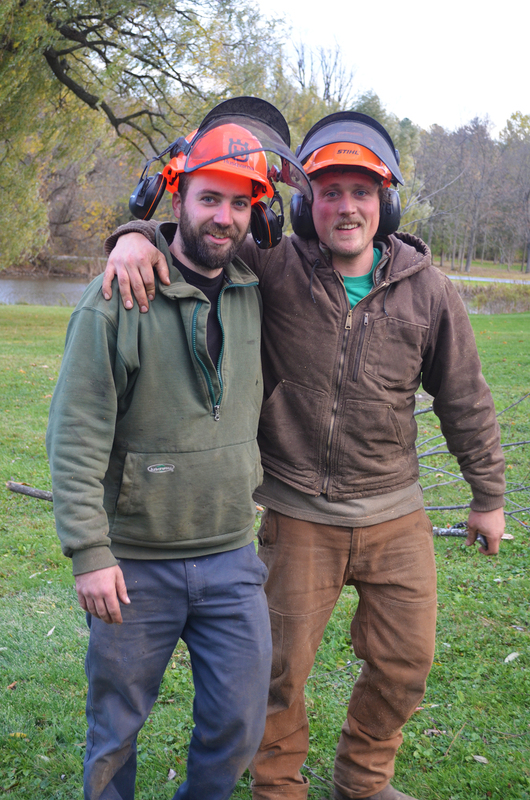 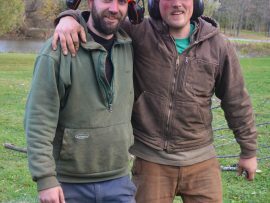 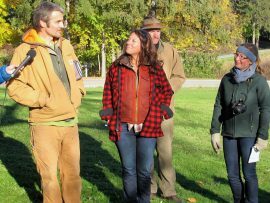 Vermont Tree Goods will make a philanthropic gift to TNC based on sales of product made from the Vermont Elm. 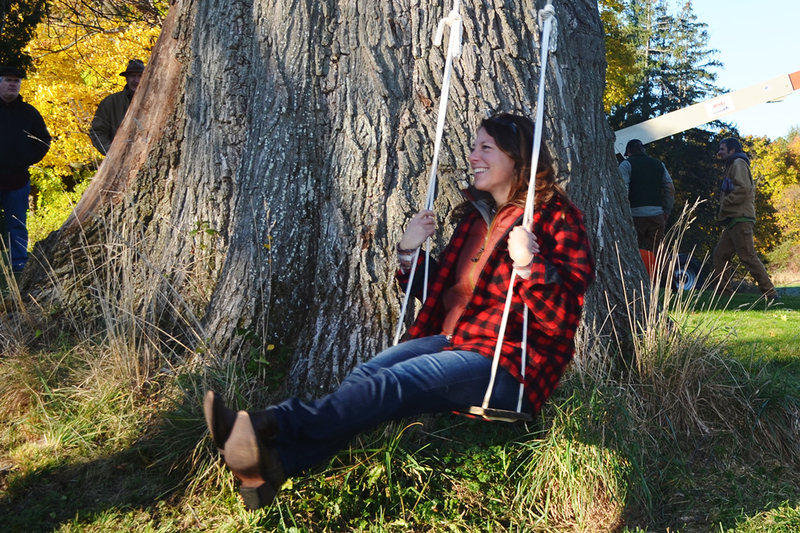 Each purchase will honor the legacy of Charlotte’s remarkable tree and help establish new communities of resistant Elms for future generations to enjoy. 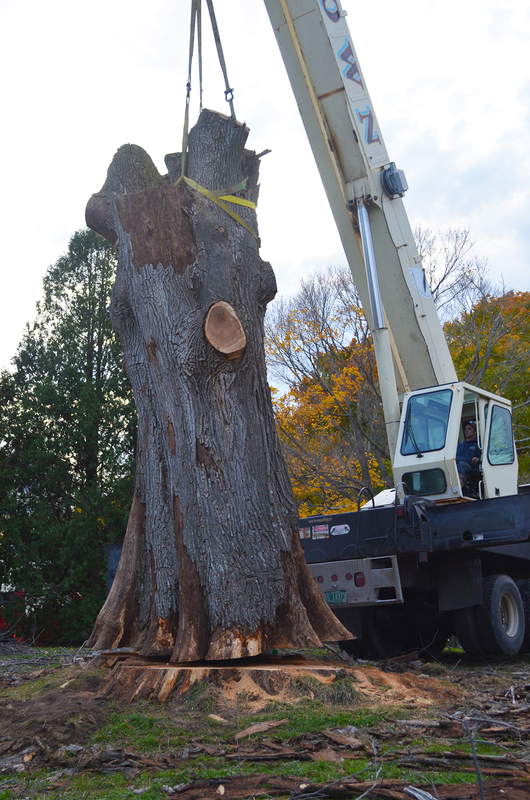 This 20ft. 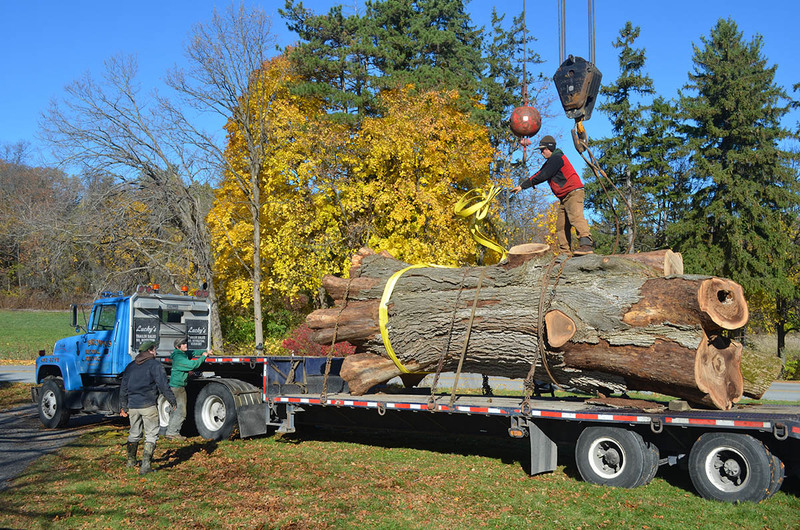 piece weighed in at about 25,000 pounds! 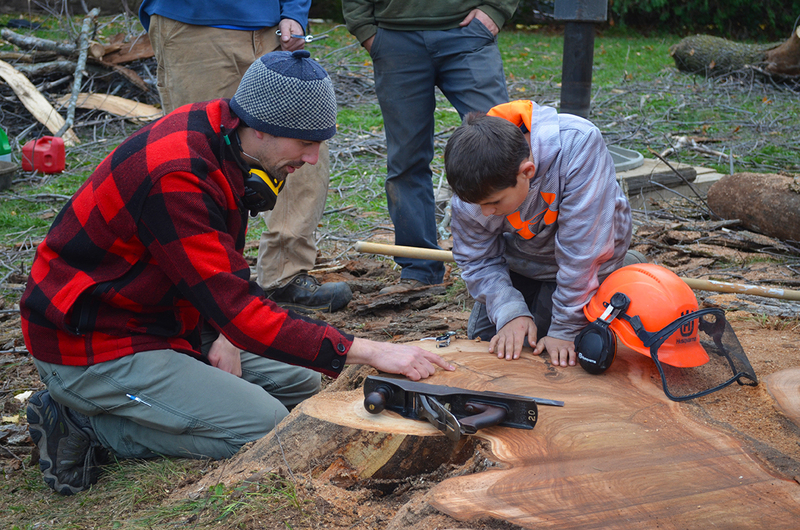 Milling of the VT Elm begins! 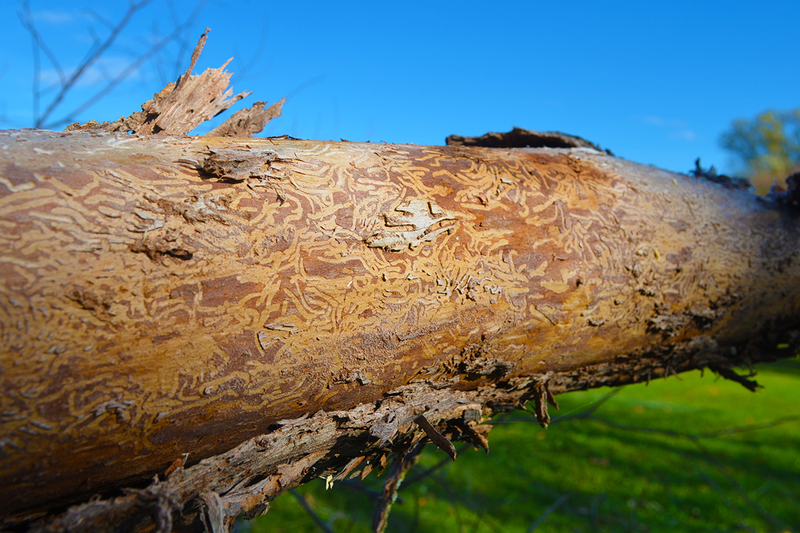 Beautiful rosy wood.